The setting takes place in early 19th century Sweden. Just outside a small forestal village lives Sofia (Pernilla August, recently seen in The Phantom Menace) and Albert (Stellan Skarsgard, Good Will Hunting/Ronin) and their two children. Albert is a glass-blower, but he makes a poor income despite his beautiful creations. Albert just hasn´t got the selling talent it takes, and he often has to push his full cart home from markets. The joy in their lifes are their children, and Pernilla and Stellan manage to create a memorable portrait of two poor but happy parents. In a lonesome castle lives the Emperor, excellently played by Thommy Berggren, and his wife. He is a somewhat tragicomical character, small and insignificant and completely misplaced as an emperor. His innermost desire is to be loved and respected, but his wife, referred to only as the Empress, despises him and suffers from constant headaches for which she blames him. The Emperor is a truly beautifully crafted character, and as he wanders down his enourmous hallways you can not resist to feel sorry for him. The first minutes of this intricate and fascinating saga directly sets a mood that continues throughout the film. 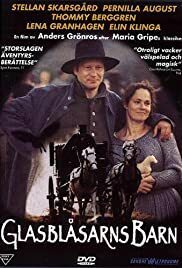 A sense of unreality, as in perhaps Ingmar Bergman´s Fanny och Alexander, and it is a mood that fits the movie perfectly. This is originally a tale written by Maria Gripe, one of Sweden´s best in the genre. Although i haven´t read the book, the film captures the essence of great storytelling, and the cast is superb. The film might be a bit scary for younger children to watch alone, so don´t resist to watch it with them.